We have already introduced you to Mydesignersales.com which has a wonderful designer collection where you can find exceptional pieces of clothing and accessories. Each and every garment is a blend of uniqueness that will make you stand out in the crowd. It has an interesting combination of designers with elegant fashion line. It is really tough to pick your favorites among their designers. I picked some of my favorites from their wide range of designers and collections. Runa Ray has the most creative and fantastic collection. This white silk and georgette blend batwing sleeve dress looks gorgeous, isn't it? This is a perfect party outfit and will definitely make the heads turn towards you. This black military jacket with embellished sleeves brings the east and west design sensibilities together. Make your evening even more fun by getting dresses in this trendy jacket designed by Runa Ray. Fuchsia pink is definitely the favorite of most women. This georgette saree designed by Bhakti Shah will make you look gorgeous. The contrast net blouse is a perfect match and will reflect your persona. Bhusattva is an eco-fashion brand which uses herbal and natural colors completely free of chemicals in each ensemble. This golden draped tunic with a V neck looks best when you pair it up with nice jewellery. Ethniche is one brand which focuses on making women look simple and elegant in her own comfort zone. 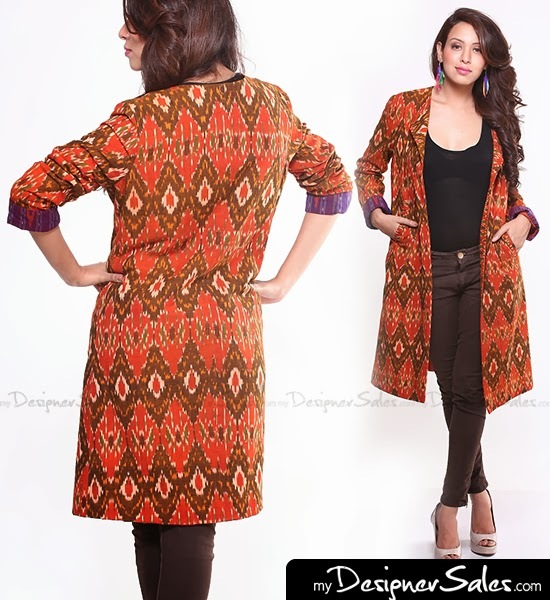 This jacket will give a kurta look when you wear it with jeans, leggings, skirts, dhotis and salwars. These are some of my favorites from Mydesignersales.com. I am sure you will love many of their designs. So head over to their website and shop! Saree looks aweosme, will check out the site. Love the collection dear..wow for the pink saree.. Which is your fav Gowthami? Amazing collection :) The military jacket is the star here!